Is there anything better than a warm Homemade Apple Dumpling? Not today there isn’t! Before I came to Kentucky I was management in a family style restaurant in the town I lived in. I worked 5 days a week. During the Fall I would take one of my days off and go to the restaurant and make triple batches of these apple dumplings. My customers would ask me what day I was going to make them, the next question was always…when will they be done? They would come in just before they were ready to come out of the oven, have dinner and a warm apple dumpling with a little milk on it for dessert. 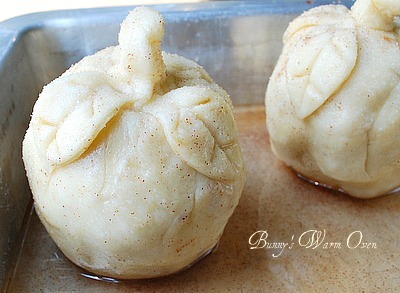 These are the only apple dumplings I’ve ever made, they’re so good, I’ve never looked for another recipe. The crust is so very soft, the sauce that’s poured over the dumplings before baking and then after it’s baked, is just delicious. Everything about this is pretty much perfect as far as we’re concerned. The very first thing we’re going to do is get the sauce made that’s poured over the dumplings, it needs to cool before it’s poured. Get your sauce ingredients together, heat on the stove until the butter melts, then I let it come to a boil a minute or two to thicken it a bit. Measure the shortening out and put it into the freezer until you have the rest of the dry ingredients together. It’ll be easier to cut into the flour when it’s very cold. Cut the shortening into the flour mixture with a pastry blender, or you can get your hands in the bowl and rub the mixture between your fingers then add the milk to the mix all at once. Mix the dough with a fork just until it forms a ball. The dough will be very soft. Flour your board, you can roll the dough out into one big piece and cut individual patches for the apples to sit on , I take the dough and divide it into 6 equal potions and roll them out individually. 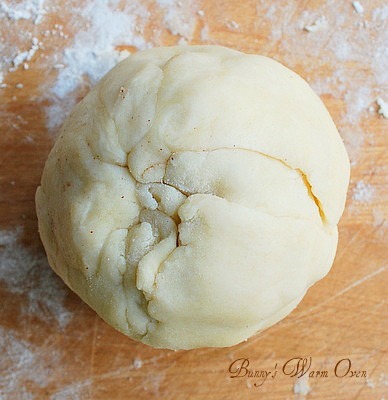 Place your peeled and cored apple in the center of the dough. Put enough butter into the hole of the apple to fill it. Sprinkle sugar ( be generous) over the apple, then sprinkle cinnamon on top. I’ve never measured the sugar or cinnamon out, I just sprinkle. Wrap the dough around the apple until it’s completely covered and looks like a ball. 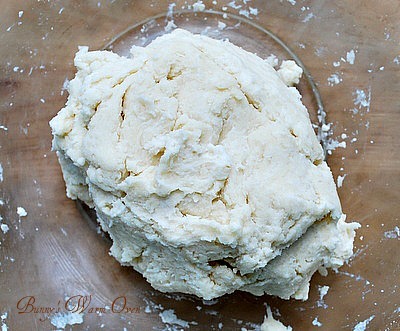 I take it in my hands like a ball and mold it and seal any opening, the dough is very easy to work with. Check the bottom and top of the apple to make sure there is enough dough at those points so none of the butter , sugar and cinnamon can leak out. I decorated the dumplings with the scrapes of dough that were left by making leaves and a stem for the apples. Pour the sauce over top of each apple dumpling. Sprinkle the apples with sugar and bake in a preheated 375 degree oven for 35 minutes. In our house we eat the dumplings warm with a little milk poured over them or with a scoop of ice cream. The apples. the sauce, the dough, the cinnamon…it’s so GOOD!! Homemade Apple Dumplings, I hope you love these as much as we do! 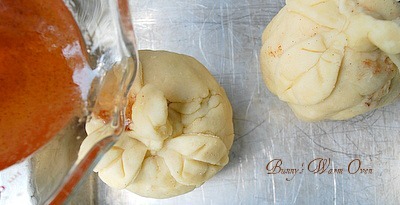 Homemade Apple Dumplings - These apple dumplings are delicious and so easy to make. The homemade dough is easy to make, the recipe comes together fast, the results are wonderful. 6 small Macintosh or Gala Apples about 3 inches in diameter Peeled and cored. Do not cut in half I used Gala, leave them whole. Make the sauce first so it has time to cool down. Make the dough and refrigerate it until you have peeled and cored your apples. I put all the sauce ingredients together in a medium saucepan. When it comes to a boil, I let it boil a minute or two to thicken a little bit. Place the flour, baking powder and salt into a large bowl. 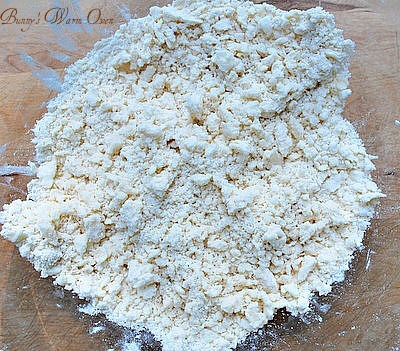 Cut the shortening into the flour mixture with a pastry blender. Add milk all at once. Stir with a fork until the dough just forms a ball. Place in the refrigerator until you have peeled and cored the apples. Peel and core the apples. You can keep the apples from turning brown by placing them in cold water while you work. I divide the dough into six equal portions and roll them out on a lightly floured surface individually. You can also roll the dough out on a lightly floured surface long enough to fit 6 apples on it and cut the dough into six squares. 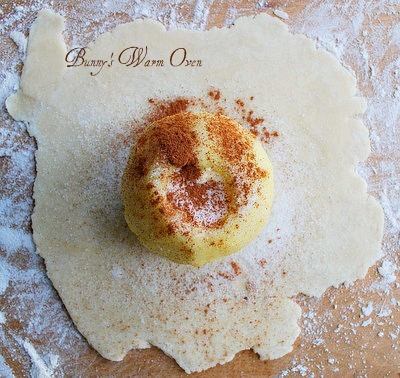 Place the apples on a dough square, fill the center with butter, sprinkle sugar over top then sprinkle cinnamon over top. Mold the dough around the apple, making sure there are no opening for the filling to escape from. Place the apples in a 13x9 inch baking pan. Spacing them about an inch apart. Pour the sauce over the dumplings , then sprinkle with sugar. Bake in a preheated 375 degree oven for 35 minutes. Spoon the sauce on the bottom of the pan over the apple dumplings after they come out of the oven. Crisco – I make my pie crust with lard. Lillian, I wouldn’t use butter, I’d stick with he shortening. I’ve never made them with butter and I wouldn’t want you to try and have it not work! Do you know of a vanilla sauce recipe…. like K-mart used to put over them? It’s actually vanilla pudding warmed up. My parents used to take us kids to Kmart’s cafeteria for them and that’s what they used. The brand is Thank You and it’s not easy to find anymore. Kroger is the only place we can find it where I live in Michigan. 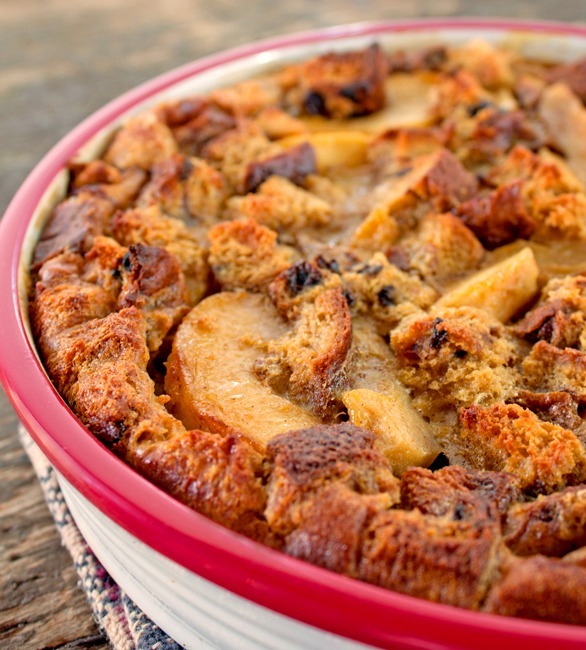 Oh my gosh I have to try it on the apple dumplings! Thank you so much Cas143cas! Vishnu manohar the chef thanks for helping Lillian Chef! Anonymous, I found a Vanilla Sauce that went with another dumpling recipe, here it is…. In a small heavy saucepan, combine flour and sugar. Gradually add cream, blending well. Add butter. Cook, stirring constantly, over moderate heat until sauce is bubbly hot. Remove from heat and stir in vanilla. Cool. Serve at room temperature or chilled over Easy Baked Fudge Pudding or other desired dessert. Store, sealed, in an airtight glass jar in the refrigerator for up to 1 week. Note: May substitute a commercial Vanilla Sauce, if desired. Note: May substitute milk or reduced-fat or skim milk for cream. May also omit butter or margarine, if desired. Flavor will not be as rich. Note: Use pure vanilla extract rather than artificial vanilla flavoring. very cool of you to do o much follow-up here. I will be pinning this. I have to find a sub for the lard ( crisco) but looks great! Thank you so much for this wonderful recipe. It’s apple season here in Maine & I can’t wait to try your recipe! You are just so helpful to people posting comments. Keep up the good work! Thank you Rose for visiting! I hope you come often! I had no shortening except butter and they turned out fine, thanks for posting such detailed instructions, made all the difference between “afraid to fail” and “courage to try”. They were awesome!! Joan thank you so much for coming and telling me you made them! You have no idea how much I enjoy hearing you made them and loved them! You are a sweetheart! Could you add chopped walnuts to the filling? thank u sooo much for the recipes luks heavenly .I will defenitely try. thank u soo much. Anonymous, YES you could put nuts in with the butter, sugar and cinnamon. I’d crush them though they’ll go in better that way. Rema, thank you so much for stopping by! Hope you love them as much as we do! I like to use lard instead of shortening, do you think that would work? Also, do you think I could make these three night before and keep them in the fridge? Thanks much, this looks wonderful. Anonymous, lard would be fine for a sub for the shortening. Fabulous recipe, thank you for sharing. When I make baked apple I add Cinnamon Hots candy pieces. When I made this recipe I added them in the center of the apples as well as in the sauce. When the sauce is poured over the pastry it looks like a red apple – so pretty! 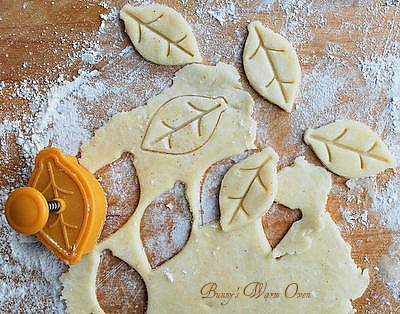 where do you buy the leaf cookie cutter? I pinned this recipe too. Yours look awesome! I have to get a few ingredients and then I am going to try my luck at them this week. Dear Bunny. I too am from Maine and will make definitely make these. I probably will use Courtlands. I am 77 and still cooking baking strong. My neighbors in the Senior Citizen’s housing where I live appreciate it. My mother used to put almond paste in the center of the apple. It is also very good! Almond paste comes in a small can, usually located in the baking aisle. Thanks for reminding me of this recipe – I’ll be making it very soon. These are so good. I used apple cider instead of water in the sauce and reduced sugar. Delish! Thank u for wonderful ” how to ” photos. These look terrific! Great tutorial on making them. I just bought some apples yesterday and I’m going to make some of these tonight for dessert. Great Terri! Let me know how it goes for you! dearcat good for you! I hope I’m still baking and going strong at 77!! God Bless YOU!! Liz, fantastic idea! Almond paste would be wonderful! Rachel Ruysch, apple cider instead of water!!! You’re a genius, good grief I bet that added TONS of flavor! Fantastic!! I’ll be trying that one too! Iman, I hope you come back and let me know how you did! Thanks for stopping by! Thank you Anonymous! I hope you love them as much as we do!! WOW this one great inovative recipe that I have ever seen. Next on the list to try and add to my autumn goodies. One little comment on shortening: I think its poison and you shouldnt be eating it. I use half butter and half organic pig lard 🙂 it makes perfect pie crust. Katja,thank you fro stopping by , I hope you get to make them soon! Yes we don’t use shortening often, butter is the word in this house! LOL!! Anonymous, yes they are wonderful! My husband requests them in the summer he loves them so much! Thank you for stopping by and telling me you made them ! I made these last week they were so good, making them again to take to our friends!!! Roseann, I’m so happy you made them and loved them! YUM….this was very good! I used store bought pie dough sheets. The dough didn’t get cooked through like an apple pie. It stayed very wet, but was still so delicious! I used brown sugar instead of white and I stuffed the inside of the apples with caramel candy! My whole family loved this! I’ll be blogging about it on Wed with a link back to this page! Thanks for this yummy dessert recipe! Lillian, Caramels in the apples!!! THAT sounds wonderful!!! Now I have to make them that way! Thanks for coming back to let me know!! Mary, I made these couple weeks ago (6pieces of heaven 😉 and I’d love to make a bunch for the Thanksgiving crowd. Have you or anyone else ever made them a day before they went in the oven? Cooking for 20+ so sure could use the input if they would be ok and any tips to keep the apples fresh? Thanks SO much!! Anonymous, I’ve never made the dough ahead of time. You probably could and keep it in the fridge wrapped in plastic. You might beable to keep apples fresh by tossing them in lemon juice and putting those in the fridge too. Megan the only time the shell ever broke for me was when I cut the apple in half instead of using a whole apple cored and peeled. I also mold the dough around the apple with my hands so it’s a snug fit. I hope this helps. 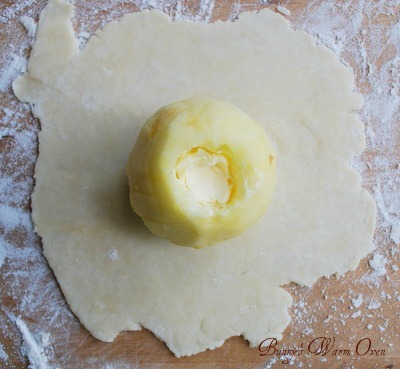 You might also try dicing the apples and making a little bundle with the dough as well. Thank you for trying and loving the recipe! Michele I just stopped by and they look terrific! Im gonna look you up on FB!! I use Braeburn apples if I can’t get Northern Spy’s.Braeburn’s are better than most others including Mac’s for baking. This is a killer recipe. Try the recipe for Bunny’s Easiest Pineapple Cake. It is absolutely the best cake in the world and almost foolproof to make . No cake mix required..Five Stars Gold Stars or whatever..
We’ve actually made these but in the middle of the apple we put apple pie filling, raisins and liquor and a nob of butter. They are amazing with a premium vanilla bean ice-cream. Thank you Anonymous!! I’m so happy you made both the apple dumplings and the pineapple cake!! Thank you Mr.CBB! Your adaptions sound wonderful!! Thank you Joanne, it was definitely a fun post to do! Got this from Skinnytaste. Looks awesome but I don’t see the nutritional info??? Hi Anonymous,I’ve never had any nutritional info about the recipe. I would like to bring these to my daughter in college. My question is: Can I make these the night before and when I see my daughter cook them at her house..
Hi AnnMarie, I’ve never made them up and let them sit over night before baking. I would say you could make the sauce and the dough and keep it in the fridge for the next day. Making sure the dough is covered in plastic wrap so it doesn’t dry out. You would have to reheat the sauce before pouring over the apples because the butter will solidify. And then peel and core the apples at your daughter’s apartment. Making them up and keeping them in the fridge overnight, I would be afraid the apples would turn brown on you. Hope this helps. Your Apple Dumplings are just gorgeous! What a wonderful recipe, and now I am SO excited for FALL! What a spectacular fall dessert Mary! These look incredibly wonderful! We love apple dumplings, especially this time of year, thanks for sharing! What BEAUTIFUL apple dumplings! And it looks so delicious too! Oh my goodness, the presentation on these is awesome. I love it. 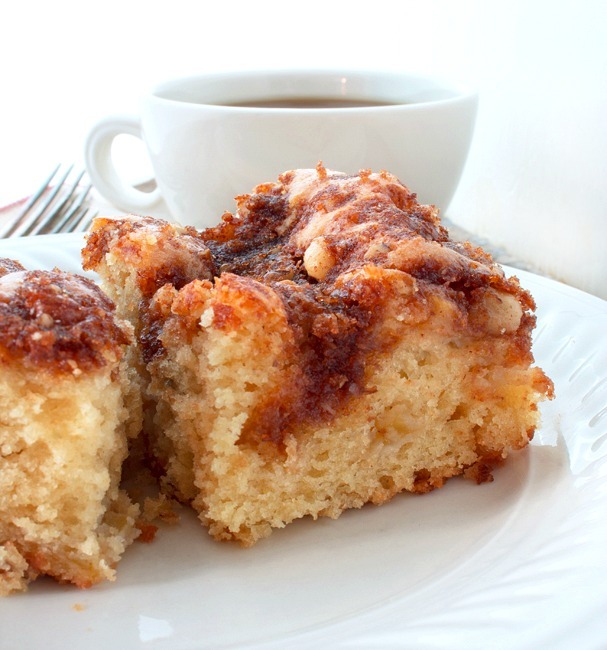 I’m definitely making these after we go apple picking. You will love them Christine!! I want this in my belly NOW! This looks delish!! Never had it like this. Oh my goodness this not only looks pretty it absolutely looks delicious!!!! I have to make these!!! If is wasn’t so late I’d start now!! :) Thank you so much for sharing at Share it One More Time…pinning this one for sure! Your welcome Tammy and thank you for stopping by! I love the artistic touches you made on the home-made apples dumplings. they look absolutely mouthwatering! My mom would love these! Thank you Kim, I love doing each and every time I make them. It’s a nice special touch. Make them for Mama! I’ll be there! Thank you Stephanie! 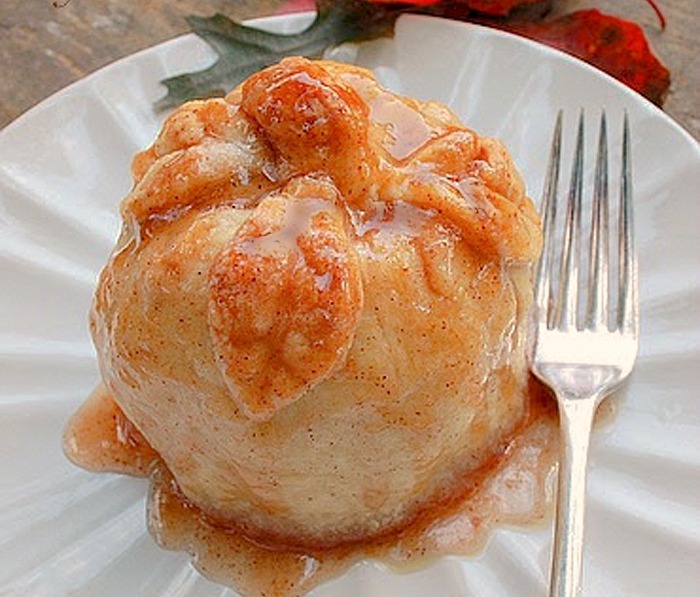 Your beautiful apple dumpling looks like a work of art. Sharing today on social media, how could I not? I’ve recently started co-hosting Foodie Fridays and would be honored if you would come by and share your fabulous recipe. The party starts Thursday 9 pm EST. Hope to see your there! Stopping by from Create it Thursday. Wow! I can’t believe I’ve never had an Apple Dumpling. I’m definitely going to have one now. These look amazing! OMGosh love love this. So beautiful and I bet taste amazing too! Just gorgeous! These would be so pretty at a dinner party. I found you via Lines Across. If you’re interested in new link parties, I have one at Gingerly Made and would love to have you join us. Have a great weekend! Thank you for the invite Ginger and for stopping by! I’ve never seen apple dumplings before! Clearly I am missing out! These look delicious and they are beautiful too! I’m going to second Shari’s comment…we’d love to have you stop by Foodie Fridays! Pinning! Happy Friday! Beautifully made, and look delicious – pinned, thank you! Delicious apple decorations! Love them! Thanks for coming and linking up at The Weekend Social. All posts get pinned on our pinterest board! Please be sure to come back next week starting Thursdays at 9PM EST on culinaryflavors.gr! I hope to see you there! This is awesome! Thanks for linking up to DIY Inspired, i’ll be featuring you tomorrow night! These look amazing! I have a huge pile of apples just begging to be baked into something Yummy! I think that this will fit the bill! Krista they are just a delicious as they are pretty too! Thank you Dina, will be there for sure! These are so beautiful! I can’t wait to try and make them. Thank you Debbie! Let me know if you try them, would love to hear about it! I have seen your comments that you have never made them a day ahead. Have you ever made them earlier in the day and then baked them just before you were ready to serve them? If so, did it work out well? Cindy I’ve never done that either BUT…I don’t see why that wouldn’t work as long as you kept them refrigerated. And obvious don’t put the sauce on them till your ready to bake. You may also want to use some lemon on the apples to keep them from browning even though they will be in the dough and refrigerated. Please come back and let me know if you do it! I am SO very glad to find your blog. My grandmother used to make Apple Dumplings many decades ago. I had her recipe on a card, but lost it when I entered it in a contest somehow. This is the first recipe I’ve seen that makes them exactly like she did. I am so glad to have it again. I’m very happy this recipe is just like your grandmothers Karen, that is absolutely wonderful! My hubby said, after I made these over the past weekend, that’s it there will be no more searching, its over! These were to die for! We are addicted!!!! Wonderful! Perfect!! Kathy, this was the first recipe I tried for apple dumplings, after I tasted it I never bothered to look for another recipe. You just can’t beat it! Thank you so much for coming back to tell me! I really like your writing style, good info, regards for putting up :D.